On a mountain range in Oakland, a lioness prowls her historic canyon. Rugged ridges and riotous riparian zones cleave the oak woodlands and chaparral into complementary halves. This is the intersection of sunlight and shadow, of wilderness and the urban, of knowledge and the unknown. Leona Canyon Regional Open Space Preserve lies between Merritt College and the housing developments on Keller Avenue, a tether to natural history hemmed in by roads on all sides. Spared from the bulldozers by a land deal between builders and the East Bay Regional Park District in 1979, these 271 acres harbor diverse communities of native plants and sustain heritage populations of bees, butterflies, birds, and beasts of the field. True, today the large mammals here are mostly joggers and off-leash dogs. But a hike on the 1.3-mile Leona Trail still feels like deliverance from the streets, a time warp back to the original trees that gave their lives and their name to the city. Amid the development of surrounding Alameda County, from which vehicle traffic now encircles the canyon, this slice of the lost wilderness yet lives. 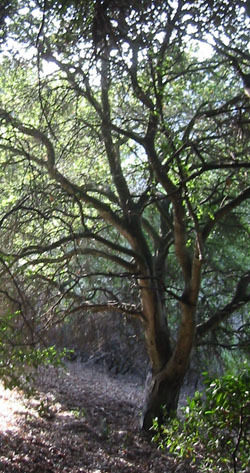 Some sunny September morning, leave your car in the parking lot on Canyon Oaks Drive and walk west into Leona Canyon. Below and to your left, the flood plain of the creek has run nearly dry -- no rain in the past several months, after all. But the robust willow and hazelnut trees prove that water still flows here, even if only underground in the dry season. Climb farther into the canyon, where the water becomes more abundant, and soon you'll hear its voice babbling from the undergrowth. As the trail ascends, the rising sun at your back sends a long shadow before you on the path. You now see compass points appearing on the landscape: two different plant communities on either side of the stream. Continue reading Step Back in Time to Leona Canyon →.